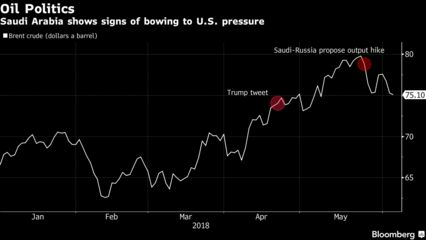 (Bloomberg) — The U.S. government has quietly asked Saudi Arabia and some other OPEC producers to increase oil production by about 1 million barrels a day, according to people familiar with the matter. While U.S. lawmakers have habitually criticized the Organization of Petroleum Exporting Countries at times of high oil prices, and the government has on occasion encouraged the cartel to pump more, it’s unusual for Washington to ask for a specific output hike, the same people said, asking not to be named discussing private conversations. It’s not clear precisely how the request was communicated. The American request was debated at a meeting of some Arab oil ministers over the weekend in Kuwait City, the people said. A statement published after the talks pledged to “ensure stable oil supplies are made available in a timely manner to meet growing demand and offset declines in some parts of the world.” Saudi Arabia and Russia last month proposed a gradual production increase, although other members of the group have yet to agree. Benchmark Brent oil futures dropped as much as 1.5 percent to $74.16 a barrel in London trading after the U.S. request was reported. To read a story on Saudi oil policy and Donald Trump, click here. U.S. Treasury Secretary Steven Mnuchin last month disclosed Washington had “various conversations with various parties about different parties that would be willing to increase oil supply to offset” the impact of U.S. sanctions on Iranian oil output. OPEC and its allies will discuss their production policy for the second half of the year in meetings scheduled on June 22 and 23 in Vienna. Saudi Oil Minister Khalid Al-Falih last month said the kingdom shared the “anxiety” of consuming nations about high oil prices and added that OPEC and its allies were “likely” to boost output.